If you want to hear a good story in song, look no further than Squeeze. The prolific songwriting duo of the band’s mainstays, Glenn Tilbrook and Chris Difford have been likened on many occasions to that of Lennon and McCartney and quite rightly so. Even if you only know their big hits, you’ll realise how they are not only write a well-constructed story that you hear, but you can actually live it. They were famously formed in Deptford, south London in 1974 after Chris apparently stole 50p from his mother to place an advert in a local shop window requesting a guitarist for a band that he hadn’t actually formed yet. Glenn was the only one to reply and the pair got together and recruited keyboard player Jools Holland and drummer Paul Gunn and thus the seeds of Squeeze were sown. A couple of years later they introduced a bass player and Gilson Lavis was brought in to replace Gunn. Their two biggest hits were Cool for Cats and Up the Junction which both reached number two, but after Cool For Cats, Holland left for a solo musical and television career and was replaced, in 1980, by Paul Carrack, a Sheffield-born musician, who’d had a brief brush with the chart in 1974 when the band Ace had a radio-friendly hit How Long. With Paul in place, in late 1980 they began recording the album East Side Story which contained three hits; Is That Love and Tempted, neither of which were big hits and Labelled with Love which reached number four. Richard Hunter, who requested this week’s choice, wanted to know how come Paul Carrack got to sing on this one and only Squeeze hit.Let’s find out. They looked around for Holland’s replacement but weren’t having much luck, “They tried a lot of people but couldn’t settle on anyone,” Paul explained. “They had just been taken on by Jake Riviera who I knew when he was a roadie for Chilli Willi and the Red Hot Peppers. He suggested they try me. I’m not sure they were totally convinced by my beard but time was running out and the studio was booked to record East Side Story. Some people think I wrote the song because at the time it was very un-Squeezelike, I didn’t, but it’s still one of their best songs ever.” So to answer Richard’s question, Paul explained how he came to do the vocal, “The band had already recorded a totally different version before I joined but Elvis Costello (who produced the album) suggested we re-record it with me singing and it worked. Thanks Elvis!” Glenn generally takes care of the lead vocal, so what did he think about having a different vocalist? “I was a bit upset at the time,” he revealed, “but when I heard Paul sing it, it was so undeniably brilliant and in a way that I would have never done, so obviously, I’m way, way over that. He did a brilliant job.” Incidentally, you can hear Elvis Costello singing prominent backing vocals on the second verse. 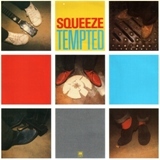 Tempted was Squeeze’s debut hit in America and it was probably due to its inclusion on two advertising campaigns for both Heineken and Burger King because the companies wanted customers to be ‘tempted’ by a good beer and a tasty burger respectively. Also, when the band are on the road and perform this song, many fans throw toothbrushes on to the stage as the vocals begin with ‘I bought a toothbrush, some toothpaste, a flannel for my face’, I guess the band would be quite happy not to be bombarded with tubes of toothpaste! It’d been cited that the song is about homosexuality with a married man being ‘tempted by the fruit of another’ i.e. wanting a gay relationship, but given what Chris said about it, I hope that myth has been debunked. Paul Carrack left Squeeze in 1982 and launched a solo career before forming Mike and the Mechanics three years later, however in 1993, he re-joined Squeeze for a tour and the recording of the album Some Fantastic Place and, like East Side Story, Paul performed lead vocals on one track, this time it was Loving You Tonight. The following year, just before departing the band for the final time, they re-recorded Tempted which was included on the film soundtrack Reality Bites.